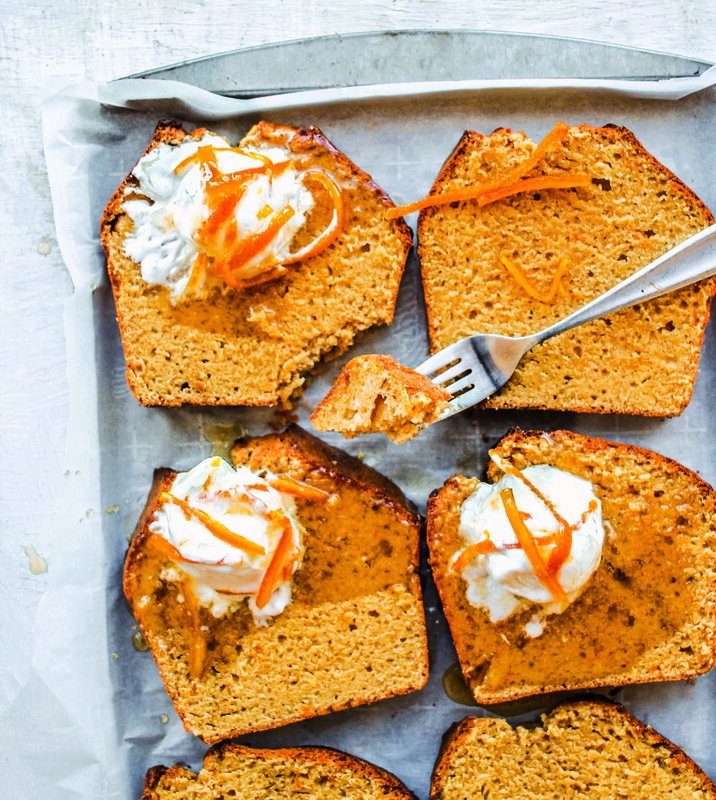 The warm, honey-like notes of saffron lend the pumpkin-flecked batter of this cake an addictive quality. Nasturtium butter helps form the cake's base - adding to its sunset looks and grassy, garden vibe - while the egg yolks deepen the colour and give it a lovely, crumbly texture. Add the pumpkin to a steamer set over a saucepan of lightly simmering water and cook until tender. Remove from the heat and set aside to cool, then mash 80 g of the pumpkin to a bowl until smooth. Reserve for later the remaining pumpkin. Preheat the oven to 175°C. Lightly grease and line a 20 cm round cake tin with baking paper. Rub the nasturtium petals into the sugar using your fingertips. Don’t be delicate here; the more you rub, the more the petals will infuse their flavour into the sugar. In the bowl of an electric mixer beat the sugar and petal mixture together with the butter and saffron threads for 6 minutes on high speed until creamy and voluminous. Continue to beat on low speed, adding the egg yolks one by one followed by the whole egg, then add the mashed pumpkin, flour, baking powder and baking soda. Mix together until combined. Pour the batter into the prepared tin, then gently push the reserved cooked pumpkin pieces into the batter so they’re evenly distributed. Bake for 45 minutes, or until a skewer inserted into the centre comes out clean. Remove the cake from the oven and leave to cool slightly in the tin for 5 minutes, then carefully turn out onto a wire rack and leave to cool completely. Sprinkle with icing sugar and serve with fresh cream. This recipe will give you a good batch of shells to reuse in your garden. Crushed coarsely they make an excellent slug and snail repellent and can add calcium to your soil, which can be a great boost to your tomato, beetroot and capsicum plants. This recipe extracted from Sticky Fingers, Green Thumb by Hayley McKee. Published by Hardie Grant. Photography by Tara Pearce. This vanilla layer cake can do it all! Right now, quinces and raspberries crossover in a farewell to warm weather and a greeting to the colder. Make this cake next season and change the fruit to caramelised apple, in summer use roasted stonefruit or berries. Scatter the cake with toasted hazelnuts or praline? Do it and be your own cake girlboss! Bake-tricks: Always cream butter and sugar on a low-medium speed as it will capture more air, more evenly into the cake batter. Don’t overwork the mascarpone as it will become grainy…a quick fold with a spatula is all that is needed. Pre-heat the oven to 170°C and line two x 20cm diameter cake pans with a circle of baking paper and canola spray. In a second bowl, lightly whisk together the whole eggs and egg whites until evenly combined with the vanilla. Add the egg mix in two batches to the butter/sugar mix. Scrape mix out into the large bowl and sift over half the dry ingredients. Mix in with hands. Mix in half the milk. Sift then mix in remaining dry stuff. Mix in rest of milk. Scale mix into the two tins – around 600 g each tin. Bring one cup each castor sugar and water to boil in a pot with a close-fitting lid. Peel and core two quinces and place into the syrup with a star anise and a cinnamon stick. Add a little handful of the cores and peel as this will amplify the red colour. Pop a circle of baking paper on the top and put a lid on. Bake at 200ºC for 30 minutes then reduce heat to 160ºC and bake until the quinces are ruby red…around 3 hours. Cool. Gently fold a tablespoon of icing sugar and a little vanilla into 750 g mascarpone. Prepare your fruit for the layering by cutting the raspberries in half and the quinces in ½ cm pieces. Split each cake into two so you have four layers in total. To assemble, trim the top of each cake flat, then cut in half horizontally. Place a cake round on a cake stand or serving plate, spread with a fifth of the mascarpone mixture, sprinkle on some fruit then top with another layer of cake. Continue layering, finishing with a cake layer that is “bottom up”. Spreading some of the remaining mascarpone on top and then put a few tablespoons in a piping bag with a star nozzle. Scatter a generous crown of fruit on the top then pipe a few mascarpone stars over the top. Drizzle with some fruit syrup and serve with layers of love! P.S.If you would just like the two layers, that’s totally fine too! Bring water to boil in a medium pot. Add butter and chocolate to pot, turn off heat and leave to melt. Stir after about 5 minutes until combined then set aside. Combine sugar, cocoa in an electric mixer with the whisk attached. Add butter chocolate mix., whisk on medium until smooth. Add raspberries and raspberry essence.Add the eggs one at a time. Scraping down sides of the bowl. Sieve flour and add on low speed until smooth. Pour evenly into a lined 9-inch cake tin. Bake at 150c until cooked. Check after 1 hour. Bring cream to near boil in pot or microwave. Add chopped chocolate. Leave 5 minutes then whisk together. Leave ganache to thicken to desired consistency and then spread over the cake with a palette knife or similar. Crumble freeze dried raspberries to decorate. 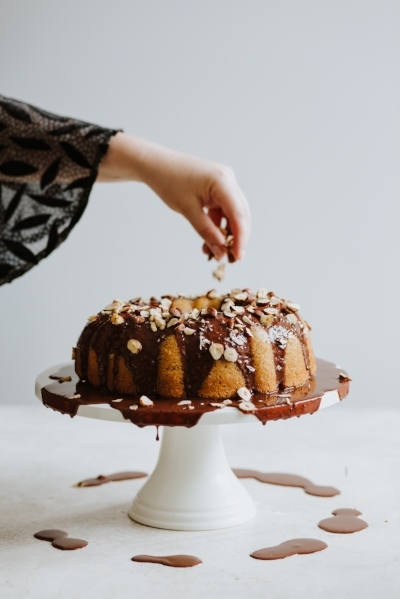 My hazelnut obsession continues with this hazelnut bundt cake. So good you’ll be coming back for more and more. Preheat oven to 160°C. Grease a bundt pan. Place water, butter and Frangelico in a saucepan and cook until combined, set aside to cool. Place dry ingredients in a bowl and whisk to combine. Add eggs, buttermilk, vanilla, salt and butter mixture to the bowl and whisk until smooth. Pour batter into the pan, cook for 1 hour or until cooked when tested with a skewer. Allow to cool. Heat the cream in a small saucepan until it begins to simmer. Remove from the heat and add the chocolate. Leave to melt for 2-3 minutes and then stir until smooth. Remove your cake from the pan and place on a cake stand. Pour ganache over your cake, and let it run down the sides to form the shape of your bundt. Top with the finely chopped hazelnuts. When the weather starts to get cooler and the days a little shorter, that time of year when you start to dream of snuggling by an open fire with a cosy blanket on your lap with a cup of something warm in your hands, this is the time that I start to crave chocolate cake. Like a delicious warm hug from the inside, a little slice of chocolate cake to accompany this dream seems just right. Add some jammy roasted plums into the mix and I’m in heaven. You can also make this chocolate cake without the plums, and instead gently roast them in a separate baking dish in the oven for around 20 minutes ready to serve alongside as a jammy compote, which gives you more options if your family has different chocolate cake preferences (like my family does). This recipe uses xylitol, a naturally occurring sweetener made from birch trees; you can also use caster sugar if that is your preference. Feel free to use almond meal instead of the macadamia meal, the result is just as delicious. Preheat the oven to 180°C / 350°F / Gas Mark 4. Grease and line the bottom and sides of an 18cm round springform cake tin with baking paper. In a medium-sized bowl whisk together the macadamia or almond meal, cacao powder, baking powder and salt until all lumps are removed. In a small bowl whisk together the eggs, xylitol or sugar and vanilla paste, until pale and fluffy. Fold the dry ingredients into the egg mixture until well combined, then stir in the milk until the batter is completely smooth. Pour the batter into the prepared cake tin and arrange the plum slices on top. Bake in the centre of the oven for around 45 minutes, or until a skewer inserted in the centre of the cake comes out almost clean. Allow the cake to cool in the tin to room temperature before removing. Serve with some double cream or creme fraiche and a few toasted macadamias for crunch. Lightly grease and line a 20 cm springform cake tin with non-stick baking paper. Preheat oven 150 degrees C.
Place the biscuits in the bowl of a food processor and process to form a coarse crumb. Slowly add the melted butter and process until combined. Press the biscuit crumb into the base of the prepared cake tin and refrigerate for 30 minutes or until firm. In a small saucepan gently heat the pouring cream with the chamomile flowers and vanilla bean. Take off heat and allow to cool while flavours steep. Once cool strain and reserve the liquid. Place the cream cheese, condensed milk and egg yolks in the bowl of a food processor and process until smooth. Add in the reserved cream and orange zest. Pulse to combine. Pour mixture over the chilled base. Place in preheated oven and cook for approximately 50 minutes or until set. NB : you want the centre to be slightly wobbly. Turn off the oven and allow cheesecake to set in the oven while it cools down. Approximately 20 minutes. Remove from oven and refrigerate for a couple of hours or overnight. Place the mascarpone, icing mixture, cream and orange blossom in a bowl of electric mixer and whisk until light and fluffy. Do not over mix as it will curdle. Spoon over the top of the cheesecake to form mounds. Garnish as desired. I miss summer days at my Big Ma’s house, when we’d sit in the driveway in an uncle or aunt’s parked car—all four of us cousins, each propping a door open with an extended leg—peeling back the skins of the fresh oranges Granny’d bought from the man who’d ride his bike down the street selling produce. I could feel the bass from the rear speakers throbbing against my back as I’d dig my thumbnail into the navel of the fruit to puncture its peel. I’d listen over the music for the sound of the pith slowly tearing away from the fruit, I couldn’t hear it and then I’d shuck away the inedible skin. If I were back there now, I’d collect those discarded peels from the backseat of the car and turn them into something good, like a glaze or a candied topping to pound cake. And so I am. Preheat the oven to 350°F (180°C or gas mark 4) and place a rack in the centre of the oven. Spray an 8.5 x 4-inch (21 x 10-cm) loaf pan with cooking spray and line it with a 3 to 4-inch (7.5 to 10-cm)-wide strip of parchment long enough to stretch across the pan and up the sides with a little hanging over. To make the cake, sift together the flour, baking soda and salt in a bowl and set aside. Combine the yoghurt, orange juice and orange zest in another bowl and set aside. Beat the butter, sugar and vanilla together in a large bowl with an electric hand mixer, or in a stand mixer with a paddle attachment, until fluffy. Add the eggs, one at a time, mixing until just combined before adding the next egg. Then add the flour mixture in 2 batches, alternating with the sour cream mixture. Pour the batter into the oiled loaf pan and bake for 40 to 45 minutes, or until a toothpick inserted into the centre comes out clean. You can place a sheet of aluminium foil loosely over the cake toward the end while it bakes so it doesn’t brown too much. Remove the pound cake from the oven, and let it rest for at least 20 minutes before lifting it from the pan. Transfer to a wire rack to cool for at least another 10 minutes before slicing. To make the glaze, in a saucepan, combine the orange juice, orange peel and sugar. Bring the juice to a boil, then lower the heat to a simmer and let it cook until it’s reduced to half, about 10 minutes. If the syrup tastes slightly bitter, stir in a pinch of baking soda to neutralize. Drizzle the syrup over the warm pound cake and serve. ALTERNATIVE ORANGES: In the winter, I love to use blood oranges for their ruby red color and tartness. You may need to compensate with a little more sugar if using. Jerrelle writes, cooks and photographs for her blog Chocolate for Basil, for baking inspiration follow her on Instagram @chocolateforbasil or check out her recently published cookbook Black Girl Baking (Page Street Publishing). Loaded with dried fruit, which gives it a lovely colour and helps to keep it nice and moist, this cake is the bomb. 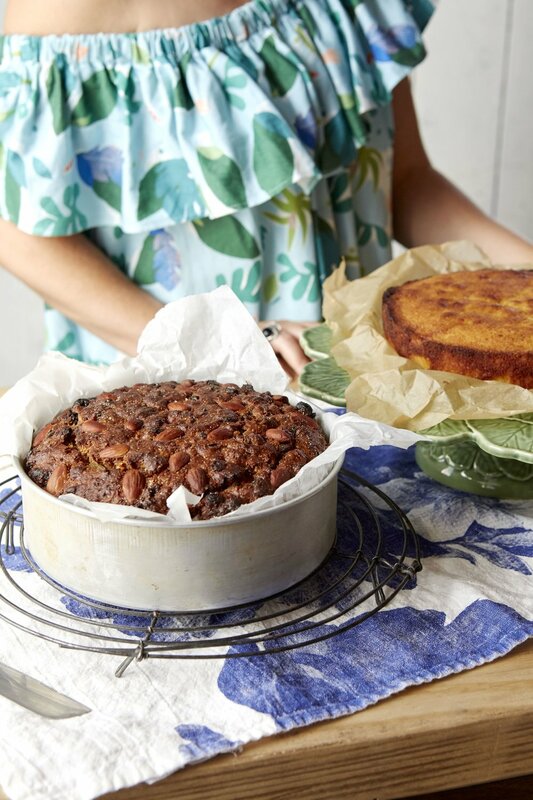 My Mum has been baking this fruitcake at Christmas for as long as I can remember – in fact, when I was living overseas I insisted she send me the recipe so I could make it for Christmas myself. She duly did, faxing the page over to me (this was 2001) straight from her original recipe book, complete with measurements in pounds and ounces and handwritten notes and corrections. Preheat the oven to 180°C (350°F/Gas 4). Grease and line a 22 cm (83/4 in) round cake tin with baking paper. Add the butter, milk, sugar, dried fruit, walnuts and spices to a saucepan over a medium heat. Bring to the boil, stirring gently with a wooden spoon to dissolve the sugar as you go, then lower the heat and let simmer for 5 minutes. Remove from the heat and leave to cool, then add the sherry, bicarbonate of soda and beaten eggs and mix well. Fold in the flour and baking powder to form a batter. Pour the batter into the prepared cake tin, arrange the almonds over the top and bake for 60 minutes, or until a skewer inserted into the centre comes out clean. Leave to cool slightly in the tin, then turn out onto a wire rack to cool completely. Keep in an airtight container for up to 7 days. I miss the tropical flavours of Florida, the tangy Key limes, the fallen coconuts drying out underneath our neighbour’s palm trees and the saccharine smell of overripe mangoes. We’d buy a couple of containers of mango meat from the 45th Street flea market and they’d be soaked in lime juice and coated in cayenne pepper. Munching on the marinated spears, we’d stroll through the market staring up at the hanging mannequins dressed in FUBU and all the latest trends, and pass by all the men and women gathering inside the open barbershops and braiding salons. That was usually how we’d spend a Saturday. Preheat the oven to 350°F (180°C or gas mark 4) and position 2 racks in the centre of the oven. Have three 8-inch (20-cm) cake pans oiled and their bases lined with parchment nearby. To make the cake, in a small bowl, combine the milk, lime zest and lime juice and let it sit until curdled, about 3 minutes. In a large mixing bowl with a handheld beater or in a stand mixer with a paddle attachment, cream the softened butter, sugar and vanilla until smooth and fluffy. Add the room temperature mango puree, ¼ cup (60 g) at a time, continuing to mix until it’s completely combined. In a medium bowl, combine the flour, baking soda and salt. Gently fold the dry ingredients into to the mango mixture in 2 batches, alternating with half the milk, being careful not to overmix (a few clumps of flour in the batter is fine). Fold in the coconut. Divide the batter among the 3 cake pans, smoothing out the top, and bake them for 25 to 30 minutes, or until golden brown and a toothpick inserted into the centre comes out clean. Remove the cakes from the oven, transfer them to a wire rack, and allow to cool completely before icing, at least 1 hour. If you are making this a day in advance, let the cake come to room temperature, then wrap it in plastic wrap and keep it on the counter until you’re ready to ice it. To make the mango mousse icing, combine the mango puree, sugar, salt and lime zest in a small saucepan over medium heat. Cook for a few minutes, until the sugar dissolves, then whisk in the tapioca. Cook, whisking constantly so the bottom doesn’t burn, until the mixture is very thick, 3 to 5 minutes. Transfer the mixture to a bowl, and place it in the fridge to allow it to cool completely so it doesn’t heat the whipped cream. When it’s time to assemble the cake, finish the mousse: in a large mixing bowl, beat the whipped cream until soft peaks form, then slowly drizzle in the cooled mango mixture, and beat on high speed until stiff peaks form. 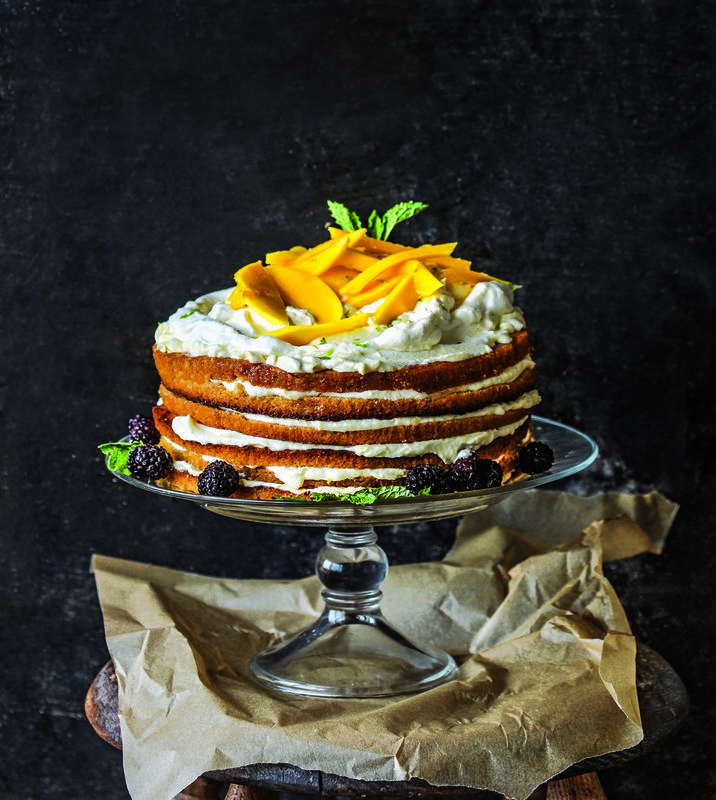 For a multilayered cake, slice the cooled cakes through the centre before icing, otherwise place one cake upside down on a cake stand, add one-fourth of the whipped mousse on top, smooth it out almost to the edges with an offset spatula and then top with another mango cake turned upside down. Add another one-fourth of the mousse and smooth to the edges. Add the final cake on top and add the rest of the whipped mousse on top, creating divots and peaks with the back of the spatula. Garnish with the mango slices and serve. VEGAN OPTION: Replace the heavy cream by chilling two 15-ounce (420-g) cans of full-fat coconut milk (preferably Thai Kitchen brand) overnight, then open the cans upside down and drain away the coconut water that has separated from the cream. Scoop out the coconut cream and proceed with the recipe.